4 Morning Teas to Jump-Start Your Day - The Co.
I’ve never been a coffee person, but I always, always start my day with a hot cup of tea. I know the caffeine fix you get from coffee is almost unbeatable, but it makes me super jittery and with so many conflicting viewpoints on whether or not it’s good for us, sticking to feel-good tea just makes the most sense. There’s something about a cup of tea that is so relaxing. If you’re prone to stressful mornings, sitting down, taking a bit of me-time, and sipping some tea will help to start your day off on the right foot. Plus, there are heaps of caffeinated teas that will give you the energy boost you need to get your through the day. I always suggest buying loose-leaf tea from stores like Teavana and David’s Tea for the flavour and benefits, but if bagged tea is all you can get your hands on, that’s great too. A sweet earl grey crème black tea will allow you to relax, at the same time providing you with increased energy. And for you coffee devotees out there, a switch to organic matcha will give you the sustained focus and energy you crave. 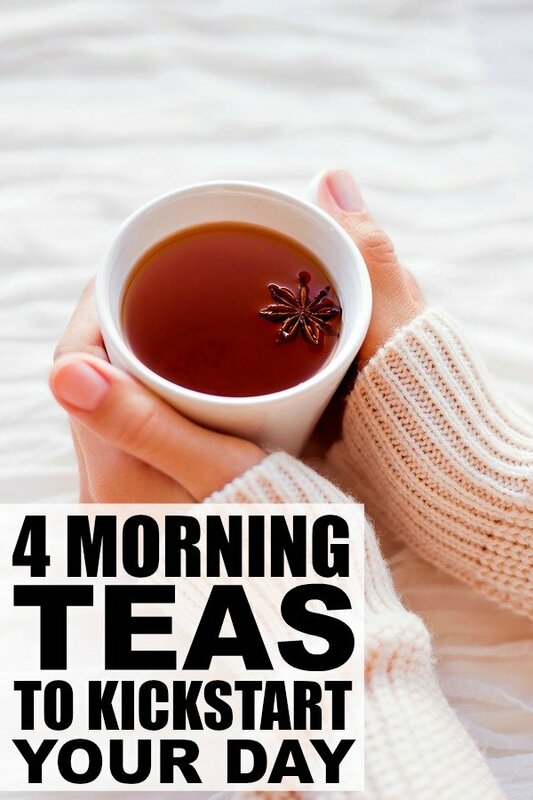 Below, read all about 4 amazing morning teas that will help you get a jump-start on your day. A cup of matcha tea is equivalent in caffeine content to a cup of coffee. The difference is that it gives you a boost of energy without the crash. It’s also super high in anti-oxidants and great for your metabolism – a real cleanse for your system. Straight matcha is the healthiest choice, but matcha tea lattes are perfect for those who want a subtler matcha taste and a delicious start to their day. If you don’t want something quite as strong as matcha, a straight green tea can kick-start your day just as well. On top of that, it’s packed with health benefits including detoxing properties and compounds that can improve your brain function. A nice black tea in the morning is usually my go-to. Sometimes I’ll have it black, other times I’ll add milk and sugar, depending on my mood. Black tea provides you with increased energy, while at the same time relieving stress. Any black tea is good, but earl grey creme black tea (earl grey with vanilla and bergamot) has to be my favourite. It’s creamy, sweet and makes you feel warm inside and out! Famed for its popularity in Chinese restaurants (especially at dim sum) oolong tea has a lovely aroma that is perfect for any morning. It also has a high caffeine content and boosts your metabolism, so it’s known to be effective for weight loss. Plus, it improves your mental performance and alertness to help productivity throughout the day. If you’re a morning tea-drinker like we are, and enjoyed these suggestions to kickstart your day, please share them on Pinterest! And if you’re looking for more health-related tips and tricks, please follow our Health & Fitness board where we share all kinds of great advice! This is an excerpt from the article 4 Morning Teas to Jump-Start Your Day which originally appeared on http://www.cloudywithachanceofwine.com/.